These colourful little birds are summer visitors to Britain, usually arriving in April and early May and leaving by early October; they spend the winter months in southern Africa. In common with other wagtails, when 'at rest' only the head, wings and body get any degree of rest: the restless tail flicks up and down continually. Typically 27cm long and with a wingspan of about 25cm, the Yellow Wagtail is very variable - across its range several 'races' are recognised by experts (and some of these colour forms are so distinctive that some authorities treat them as separate species). The Yellow Wagtail is not always easily differentiated from the Grey Wagtail, which has a longer tail but also lots of yellow in its colouring. One helpful feature is that Grey Wagtails have a grey or blackish triangular bib. In the breeding season, when we see them in Britain, Male Yellow Wagtails have much bolder black and yellow-green colouring, while the plumage of females is a more subdued creamy-buff and grey. In both cases, the slender legs are black, and the bills are dark grey or black. Very rare nowadays in Wales and Scotland, in Britain the Yellow Wagtail is most often seen in central and eastern England; however, their numbers are a small fraction of what they were in the middle of the 20th century. 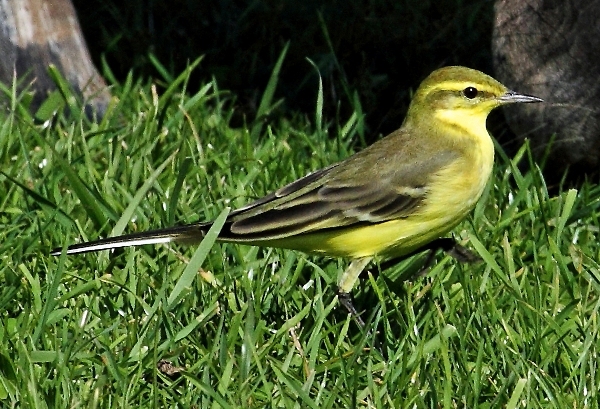 In 2009 the Yellow Wagtail was added to the Red List as a bird of conservation concern. Yellow Wagtails are mainly insectivorous. When feeding in marshes, bogs and wet pastures, they run along the ground chasing flies, small beetles and other grassland invertebrates that have been flushed out by the hooves of horses, cattle or other farm animals. Grey Wagtails, in contrast, feed mainly along rivers and streams, where they intercept ephemeroptera (mayflies), plecoptera (stoneflies), trichoptera (caddis flies or sedgeflies) and a variety of waterside diptera while in flight. These ground-nesting birds build cup-shaped nests in tussocks of long grass or rushes, using pieces of plant material lined with fur. They produce one and quite often two broods, usually of five or six glossy grey-buff eggs spotted with darker buff. The eggs are incubated for up to two weeks by the female. Once they hatch, the young are fed by both parents for about another two weeks until they are fledged and able to fend for themselves.